Are you looking to live a BPA-free life? Yeah, that’s a good idea. The chemical Bisphenol-A (BPA) is one nasty friendship to welcome into your world. Most people know that BPA exists in many plastic containers or water bottles, the interior lining of many canned soups and vegetables, and in a slew of baby bottles, but did you know that it’s also found in cash register receipts? Why is BPA so bad? It’s an endocrine disruptor that mimics estrogen and has been linked to aneuploidy, adipogenesis, and other scary problems with funny names. Drinking water or eating food containing leached BPA may cause chromosomal disruption, miscarriages, birth defects, or obesity. So maybe you’ve started buying fresh, non-canned vegetables, drinking out of your own BPA-free water bottle, and using glass containers instead of plastic…but what did you do with all of the receipts from those BPA-free purchases? Luckily, not all receipts are laden with BPA. The type you want to watch out for is thermal coated paper – the kind that’s shiny on one side (which is a large percentage of receipts). The normal bond paper should be free of BPA. 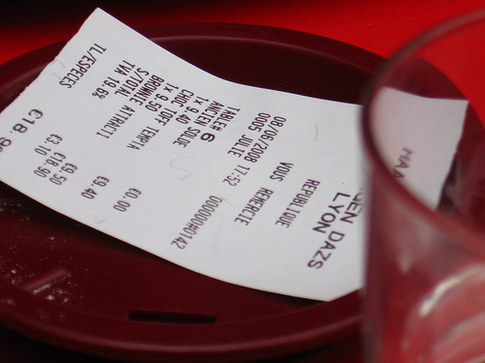 Read the rest of Care2’s article for more tips on avoiding BPA in receipts. But what do you do if you need to keep track of receipts for expenses or other financial reasons? Simply enter the 21st century. There is absolutely no reason to keep boxes and boxes of receipts filed away for financial reasons. If you have a scanner or, even better, a cell phone with a camera on it you can simply keep digital copies of those receipts on file. My personal tool of choice for tracking expenses digitally is Evernote. And don’t worry about the IRS, digital copies of receipts are perfectly acceptable (and actually preferred) in the unfortunate event of an audit. What other ways do you avoid BPA in your day-to-day life?